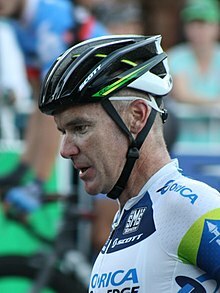 Stuart O'Grady OAM (born 6 August 1973) is a retired Australian professional road bicycle racer, who rode as a professional between 1995 and 2013. A former track cyclist, O'Grady and Graeme Brown won a gold medal in the Men's Madison at the 2004 Summer Olympics. O'Grady also won Paris–Roubaix in 2007. O'Grady competed in the Tour de France from 1997 and contended for the points classification in the Tour de France known as the green jersey, finishing second in the 1998, 1999, 2001 and 2005 races. He wore the yellow jersey of general classification leader in 1998 and 2001. Stuart O'Grady was born in Adelaide and grew up as a part of a cycling family. His father represented South Australia in road and track cycling, and his uncle, Robert Baird, is a former Australian cyclist who competed in the men's team pursuit at the 1964 Summer Olympics. As a student, he attended St Paul's College. At this time, he started in track cycling and won a silver medal in the 4000m team pursuit at the 1992 Summer Olympics in Barcelona at age 18. In the 1996 Summer Olympics in Atlanta he won bronze medals in both the points race and team pursuit. He was an Australian Institute of Sport scholarship holder. He joined the GAN professional team, which included English time trial specialist Chris Boardman. This team became known as Crédit Agricole from 1999. In the 1998 Tour de France, a race for which he confirmed to doping himself with illicit and proscribed erythropoietin, he wore the yellow jersey for three days. He also won his first stage. In 2001 he wore the yellow jersey for six days. He was Australian Cyclist of the Year and Australian Male Road Cyclist of the Year in 1998 and 2001. In 1998 he finished second in the green jersey classification. On 6 July 2000, he pulled out of the Tour de France after breaking his collarbone in three places with 85 kilometres (53 mi) to the finish, he still finished the stage. In 2001, O'Grady had been in contention for the green jersey with Erik Zabel but he was defeated on the final day. In 2001, he had a narrowing in the iliac artery. Tests showed his right leg produced more power than his left. After surgery in April 2002, he was again in contention in the 2002 Tour de France. In 2003 and 2004 he was overshadowed in the green jersey competition by fellow Australian sprinters Baden Cooke (2003) and Robbie McEwen (2004). O'Grady still managed to win his second Tour de France stage, in 2004. O'Grady at the 2005 Tour de France. O'Grady moved to Cofidis in 2004 to concentrate on races such as Paris–Roubaix and the Tour of Flanders. After a start fraught with injuries and doping allegations in his team, he won two stages and the points classification in the Critérium du Dauphiné Libéré. He won a stage in the 2004 Tour de France and spent a few days in the green jersey. He won the UCI Road World Cup race, HEW Cyclassics. He topped his victories by winning an Olympic gold medal in the madison cycling with Graeme Brown. In the 2005 Tour de France, O'Grady came second in the green jersey classification to Thor Hushovd of Norway, followed by Robbie McEwen. Late in 2005, he signed a one-year contract with Bjarne Riis to ride on Team CSC, now known as Saxo Bank, for 2006. He broke several ribs in an early season race in Italy and a vertebra in the Tour de France. O'Grady continued riding the Tour despite the pain, coming third in the final stage. Early in 2007, O'Grady became the first Australian to win a major classic when he crossed the line first in Paris–Roubaix. He had a puncture midway but recovered to rejoin the field before arriving alone in the Roubaix Velodrome. On 15 July 2007, O'Grady was forced to abandon on stage 8 of the 2007 Tour de France, from Le-Grand-Bornand to Tignes, after crashing on a descent, fracturing eight ribs, his right shoulder blade, right collar bone and three vertebrae, and puncturing his right lung. O'Grady crashed 30 kilometres (19 mi) into the 2009 Milan–San Remo when another rider came down in front of him, he punctured his lung and suffered a broken right collar bone once again as well as a broken rib. On 8 August 2011, O'Grady announced that he had joined the new Australian team GreenEDGE for 2012. He announced his retirement from professional cycling as a competitive rider on 23 July 2013, following the conclusion of the 2013 Tour de France. On 24 July 2013, O'Grady was named in the French Senate report detailing EPO use in the 1998 Tour de France as having returned a sample suspicious for EPO use. He confirmed the same day in an interview with an Australian newspaper that he had taken EPO prior to the 1998 Tour de France, but stated that the arrests around that Tour scared him off doping in the rest of his career. This announcement has created some controversy amongst cycling fans, as O'Grady had been a vocal critic of the doping culture that existed in the late 1990s and early 2000s. As a result of his doping admission, the Australian Institute of Sport indefinitely suspended O'Grady from its 'Best of the Best'. O'Grady had been inducted in 2006. O'Grady set up and financially supports an Australian junior cycling development team, CSC Team O'Grady, which was established in 2005. O'Grady is today a member of the 'Champions for Peace' club, a group of 54 famous elite athletes committed to serving peace in the world through sport, created by Peace and Sport, a Monaco-based international organisation. O'Grady supports the Port Adelaide Power in the Australian Football League. The Stuart O'Grady Bikeway adjacent to the Northern Expressway in the northern suburbs of Adelaide is named after O'Grady. ^ a b Aubrey, Jane (8 August 2011). "GreenEdge confirms O'Grady recruitment". Cycling News. Future Publishing Limited. Retrieved 1 January 2012. ^ Wynn, Nigel (22 July 2013). "Stuart O'Grady retires from professional cycling". Cycling Weekly. IPC Media. Retrieved 3 January 2014. ^ a b c Evans, Hilary; Gjerde, Arild; Heijmans, Jeroen; Mallon, Bill. "Stuart O'Grady Olympic Results". Olympics at Sports-Reference.com. Sports Reference LLC. Retrieved 2 August 2016. ^ a b c d Homfray, Reece (25 July 2013). "I doped for 1998 Tour de France, confesses Australian cycling star Stuart O'Grady". The Advertiser. Adelaide. Retrieved 25 July 2013. ^ Kogoy, Peter (29 June 2013). "Stuart O'Grady enters Tour de France record books as big names fall". The Australian. Retrieved 25 July 2013. ^ "Stuart O'Grady OAM". Cycling Australia. 10 November 2011. Retrieved 25 July 2013. ^ "Robert Baird Olympic Results". sports-reference.com. Retrieved 17 August 2014. ^ "Roll of honour – AIS Roll of Honour for the Olympics". Australian Institute of Sport. Australian Sports Commission. 9 January 2008. Retrieved 18 July 2012. ^ Val Migliaccio (30 July 2007). "I'll be back: O'Grady". Adelaide Now. ^ "O'Grady recovering after surgery". Cycling Central. 24 March 2009. ^ "O'Grady joins GreenEDGE cycling team". Sydney Morning Herald. 8 August 2011. ^ "Stuart O'Grady Announces Retirement" (Press release). Orica–GreenEDGE. 23 July 2013. Retrieved 25 July 2013. ^ "French Senate releases positive EPO cases from 1998 Tour de France". Cycling News. 24 July 2013. ^ Homfray, Reece. "Stuart O'Grady says until now he had refused to believe doping claims against Lance Armstrong". News.com.au. ^ Aubrey, Jane. "O'Grady: Doping Was Never an Option". Cycling News. ^ "O'Grady suspended from AIS 'Best of the Best,". Australian Sports Commission News, 31 July 2014. Archived from the original on 5 August 2013. Retrieved 31 July 2013. ^ "Stuart O'Grady, Olympic Champion, World Champion, Cycling, Australia". Champions for Peace. Peace and Sport. Archived from the original on 21 May 2013. Retrieved 25 July 2013. Wikimedia Commons has media related to Stuart O'Grady. This page was last edited on 5 March 2019, at 14:09 (UTC).